I have just about finished my cashmere blanket. The largest surface that I have to work on is the living room floor, so making this blanket has been interesting…I’ve had lost of help! 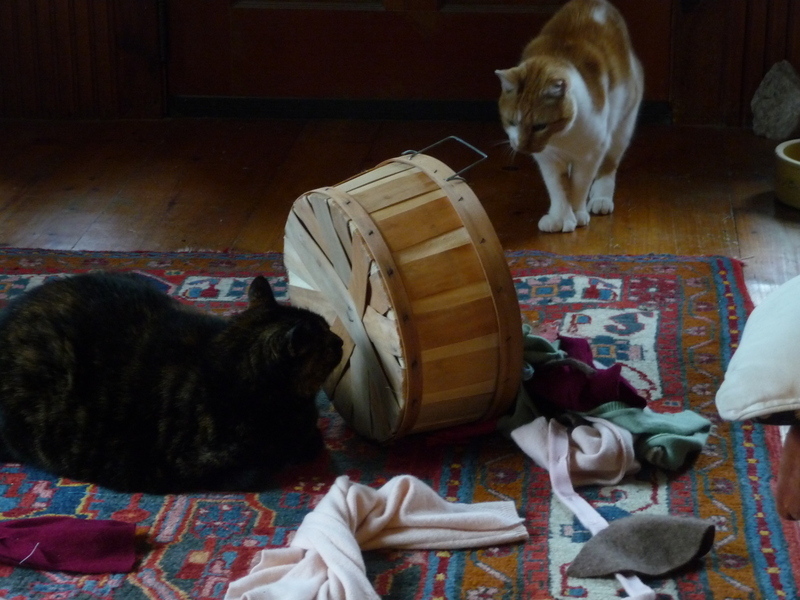 I left a basket of scraps on the floor and when I came back into the room, the cats had knocked it over, pulled out the material, and it became a prop in their game. They are curious about the new material, the scissors, thread, sewing machine. I love living with animals….there is a mini-surprise around almost every corner. It’s also interesting to watch my own mind and judgements about change and my environment. If Jack had been the one to knock over the basket and was then rearranging the contents, my first reaction would not have been delight! I rarely get angry or even irritated at animals. I don’t judge them or try to figure out their motives and my life with them is peaceful, fun and has an element of daily delight in it….hummmmm. Love this post today Mary! As an animal lover myself, it never ceases to amaze me all the joy they bring, and have brought, into my life. Your comment about if Jack had spilled the contents of the basket was priceless…and so true of all of us!!! Mary, you make me smile. Every day. I love it!!! How very true, Mary! Wonderful picture, too. Those cats look very happy. For me, I think it boils down to attribution– if my husband, children, visitors etc, rearrange my life adversly, I attribute their actions to them “wanting” to cause me problems. If my cats leave chaos, I belive they are doing “what cats do” and I find it vastly entertaining and amusing and I can even be pleased that I provided them with some pleasure! I’ll have to work on figuring that out. I Love It – It happens here to as Little Joe is almost 6 months and his sisters are just short of 3 months, need I say more. They are busy and I found I enjoy it too. They are quite the little characters, I let them be theirshelves afterall, it is their home too, Simba the 12 yr. old we took in likes to play at times but he watches the others and I think he might actually enjoy it, as he was a housecat that was abandoned in his old age, dear fella. He is a beautiful orange tabby and big. Even our dog, Dusty the shih tzu gets in on the play as he has turned 2. They all jump on each other. I wouldn’t trade these happenings for anything else. One of our kittens,Bootsey has 7 toes on each foot, imagine. The other kitten is called Snickers. This is something to definitely bear in mind next time there’s a blob of toothpaste left in the sink, haha! Just pretend the dog or cat did it! Let the little things go, huh? My favorite childhood book reading to my boys (and now my little eight year old hopefully soon to be step-grandson) is, yes, CURIOUS George! Indulge your curious selves today! All sorts of surprises are waiting to be revealed. . .
Susan, my husband figured out a long time ago to blame EVERYTHING on the dog because she is the only one who gets special dispensation on my ‘mad list’!! Good observation and advice….and a great memory of Curious George. What fun to see their kitty mischief. Thanks again Mary for such a sweet post. Can’t wait to see a picture of your blanket. It’s in time for this cold weather. We .had snow in Virginia in October, which is really rare. Stay warm all. One of the many things I love about you, Mary, is your wonderful ability to take these ‘light bulb’ moments of insight and shine a new focus on how we discriminate our actions based on the circumstance. You nailed another one!! I couldn’t agree more with Cheryl B! You, Mary, are able to see and find the meaningful and compelling possibilities in everything…the simple, the mundane, the complex, the unexpected…I aspire to be that ‘open’…thanks for being our role model and teacher! I wonder, will the kitties like the blanket as much as they enjoy the scraps? Probably the big difference is my husband knows better than to do that, but the cats are just being cats! Yours sure did have fun with the new “toys”. As a child I was dismissed or reprimanded for “asking too many questions.” My curious nature was never supported or nurtured. Suffice to say I love this post and quote from Eleanor Roosevelt. Thanks Mary!